بخشنده امنیه, حسن, بهادری, معین. (1391). تحلیل عددی اثرات ناشی از انفجار تک‌چال در تودۀ گلسنگی سد گتوند علیا. 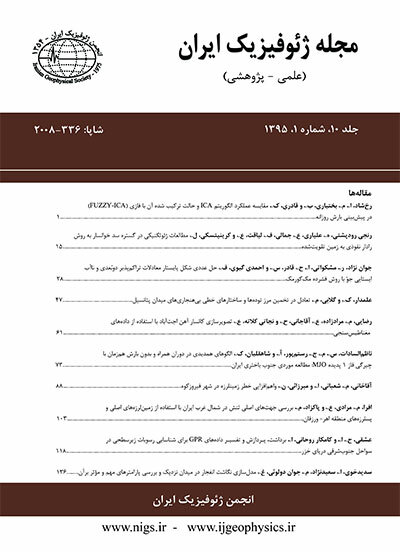 مجله ژئوفیزیک ایران, 6(2), 56-72. حسن بخشنده امنیه; معین بهادری. "تحلیل عددی اثرات ناشی از انفجار تک‌چال در تودۀ گلسنگی سد گتوند علیا". مجله ژئوفیزیک ایران, 6, 2, 1391, 56-72. بخشنده امنیه, حسن, بهادری, معین. (1391). 'تحلیل عددی اثرات ناشی از انفجار تک‌چال در تودۀ گلسنگی سد گتوند علیا', مجله ژئوفیزیک ایران, 6(2), pp. 56-72. بخشنده امنیه, حسن, بهادری, معین. تحلیل عددی اثرات ناشی از انفجار تک‌چال در تودۀ گلسنگی سد گتوند علیا. مجله ژئوفیزیک ایران, 1391; 6(2): 56-72. نحوۀ تشکیل و انتشار ترک‌ها از عامل‌‌های مؤثر در کنترل آسیب‌های ناشی از انفجار، به‌خصوص در عملیات انفجار کنترل شده هستند. به‌منظور پیش‌بینی و کنترل ترک‌های ناشی از انفجار، نتایج آزمایش میدانی تک‌چال انفجاری در تودۀ گلسنگی منطقۀ سد گتوند علیا ثبت و با روش‌های تجربی برآورد زون‌های اطراف چال انفجاری مقایسه شده است. در این آزمایش چال انفجار به قطر 76 میلی‌متر و عمق 2 متر در تودۀ گلسنگی حفاری و با یک کیلوگرم ماده منفجرۀ امولایت ترکی 27 و چاشنی الکتریکی آنی خرج‌گذاری شده است. مقادیر لرزش ناشی از این آزمایش انفجار، در دو دستگاه لرزه‌نگار VIBROLOC با فواصل 8 و 13 متری از چال انفجاری به‌ترتیب برابر 22/17 و 02/9 میلی‌متر بر ثانیه ثبت شده است. شعاع منطقۀ پودر شده برابر 25 سانتی‌متر و طول ترک‌های شعاعی برداشت شده از این آزمایش 90 سانتی‌متر اندازه‏گیری شده است. به‌کمک نرم‌افزار المان مجزای UDEC نحوۀ انتشار ترک‌ها و لرزش‌های ناشی از انفجار در تودۀ گلسنگی منطقۀ سد گتوند علیا مدل‌سازی و با نتایج آزمایش میدانی و روش‌های تجربی برآورد زون‌های اطراف چال مقایسه شده است. در تحلیل عددی شعاع منطقۀ پودر شده و طول ترک‌های شعاعی اطراف چال انفجاری به‌‌ترتیب 20 و 90 سانتی‌متر و مقدار لرزش‌های ناشی از انفجار در فواصل 8 و 13 متری به‌ترتیب 2/17 و 27/9 میلی‌متر بر ثانیه برآورد شده که نشان‌دهندۀ دقت و صحت زیاد روش عددی المان مجزا در برآورد نتایج انفجار مانند تغییرشکل‌های موم‌سان و لرزش‌زمین است. نتایج این بررسی نشان می‌دهد که مدل‌سازی عددی انطباق مناسبی با مقادیر اندازه‌گیری شدۀ میدانی دارد و رابطۀ اسن و همکاران و مدل تجربی ایشان به‌ترتیب در برآورد منطقۀ پودر شده و ترک‌های شعاعی اطراف چال انفجاری قابلیت اعتماد بیشتری دارند. Drilling and blasting have numerous applications in civil and mining engineering. However, there are many unfavorable associated side effects and hazards, such as ground vibrations, air blasts, fly rocks, back-breaks, unwanted displacements, crack formation and propagation, and extended crushed zones, all of which need to be predicted and controlled effectively. Ground vibrations caused by blasting can damage the zones in the vicinity of the explosion block and its associated civilian structures and equipment. In addition to environmental and structural damages, air blasts can irreversibly damage the health by affecting the hearing sense and mental stability of the personnel. Damages to the front face, caused by open-pit and underground explosions, not only increase the maintenance costs, but also make the appearance unacceptable. An important factor in reducing hazards in controlled blasting is the prediction of crack formation around the blast-hole and its propagation, which has been the subject of research since early 1950’s using field experiments, analytical methods and numerical simulations, paving way for many semi empirical correlations presented in the literature on this matter. As a rule of thumb, the radius of the crushed zone and the length of the radial cracks, are assumed to be in the order of 3 to 5 times and 40 to 50 times that of explosive radius, respectively. Hence, the radius of the crushed zone and the radial crack lengths were evaluated to be 10.16 cm and 114 cm, respectively. In this study, the results of the field studies from single blast-holes in the mudstones of Gotvand Olya dam were compared with several empirical correlations, using a blast-hole of 76 mm diameter, 2 m depth, 1 kg emulate 27 charge and a single instantaneous electrical cap. Two seismometers of VIBROLOC placed 8 m and 13 m away from the blast-hole recorded the ground vibration at 17.22 and 9.02 mms-1, respectively. The crushed zone radius and the radial crack length were measured to be 25 cm and 90 cm, respectively. The crack propagation and the ground vibration were compared with the field study results using a UDEC discrete element method. In the simulation exercise, the dynamic loading on the surrounding walls of the blast hole were assumed to be uniform and in radial direction. Also, the blast was assumed to take place instantaneously along the cylindrical charge and the semi-empirical relationship of Liu and Tidman was used to evaluate the maximum detonation pressure produced. The simulation results included a variation in the peak particle velocity with respect to the distance from the blast hole centre, a variation in the particle displacement, a variation in the applied stresses caused by the shock wave travelling, reflecting the stress wave from a free face. The numerical analysis indicated the crushed zone radius and the radial crack length to be 20 and 90 cm, respectively. Also, the ground vibrations at 8 m and 13 m distances away from the blast-hole were simulated to be 17.2 mms-1 and 9.27 mms-1, respectively. Amongst the empirical correlations used, Ash correlation (1963) revealed a radial crack length of 110 cm, and Essen et al. (2003) evaluated a crushed zone radius of 19 cm, indicating more accurate estimations. This study indicates that the numerical analysis used is capable of presenting acceptable accuracy. نوروزی، غ.، غفوری آشتیانی، م.، جوان دولوئی، غ. و مختاری، م.، 1386، تعیین وابستگی امواج S و P در ناحیه مشهد، مجله ژئوفیزیک ایران، 1، 21-35. کاظمی، م.، قاسم­العسکری، م، ک. و جواهریان، ع.، 1388، مدل‌سازی لرزه­ای محیط­های همسانگرد صوتی و صوتی گرانرو در حیطۀ tau-p، مجله ژئوفیزیک ایران، 3(1)، 33-43. Ash, R. L., 1963a, The Mechanics of Rock Breakage (Part 1). Pit and Quarry ,56(2), 98-100. Ash, R. L., 1963b, The Mechanics of Rock Breakage (Part 2), Standards for Blasting Design. Pit and Quarry , 56(3), 118-122. Atchison, T. C., Duvall, W. I. and Pugliese, J. M., 1964, Effect of decoupling on explosion generated strain pulses in rock. Washington, DC: U.S. Bureau of Mines (USBM). Cook, M. A., 1956, Theory and new developments in explosives for blasting. 6th Annual Drilling and Blasting Symposium, University of Minnesota, 31-44. Djordjevic, N., 1999, Two-component of blast fragmentation. Proceedings of the 6th International Symposium on Rock Fragmentation by Blasting-Fragblast-6, Johannesburg, South Africa: South African Institute of Mining and Metallurgy, 9-213. Drukovanyi, M. F., Komir, V. M., Myachina, N. I., Rodak, S. N. and Semenyuk, E. A., 1973, Effect of the Charge Diameter and Type of Explosive on the Size of the Overcrushing Zone During an Explosion. Mininig Science, 500-506. Duvall, W. I., 1953, Strain-wave Shapes in Rock near Explosion. Geophysics ,18, 310-326. Duvall, W. I. and Petkof, B., 1959, Spherical propagation of explosion-generated strain pulses in rock. Washington, DC: U.S. Bureau of Mines (USBM). Esen, S., Onederra, I. and Bilgin, H. A., 2003, Modeling the size of crushed zone around a blast hole. International Journal of Rock Mechanics and Mining Science, 40(4), 485-495. Fourney, W. L., 1983, Gas Well Stimulation Studies. In H. P. Rossmanith (Ed. ), Rock fracture mechanics. Verlag: Springer. Graff, K., 1975, Wave Motion in Elastic Solids. Oxford: Clarendon Press. Hagan, T. N., 1983, The Influence of Controlable Blast Parameters on Fragmentation and Mining Costs. Proceedings of the 1st International Symposium on Rock Fragmentation by Blasting-Fragblast-1, Lulea, Sweden, 31-51. Heynrich, J., 1979, The Dynamics of Explosion and Its Use. New York: Elsevier Scientific Publishing Company. Hino, K., 1956, Fragmentation of Rock through Blasting. Journal of the industrial explosive society, 17(1), 2-11. Hustrulid, W., 1999, Blasting Principles for Open Pit Mining (Vol. 1). Balkema, Roterdam. Hustrulid, W. A. and Johnson, J. C., 2008, A Gas Pressure-based Drift Round Blast Design Methodology. In H. Schunnesson, and E. Nordlund (Ed. ), 5th International Conference and Exhibition on Mass Mining Sweden, Lulea: Lulea University of Technology, 657-669. II’yushin, A. A., 1971, The mechanics of a continuous medium (in Russian). Moscow: Izd-vo MGU. Itasca Consulting Group, Inc., 2004, Universal Distinct Element Code, Version 4, 01. Minneapolis, Minnesota. Iverson, S. R., Hustrulid, W. A., Johnson, J. C., and Akbarzadeh, Y., 2010, The Extent of Blast Damage from a Fully Coupled Explosive Charge. Proceedings of the 9th International Symposium on Rock Fragmentation by Blasting-Fragblast-9 London: Taylor and Francis Group, 459-468. Iverson, S., Kerkering, C. and Hustrulid, W., 2008, Application of the NIOSH-Modified Holmberg-Persson Approach to Perimeter Blast Design. Proceedings of the 34th Annual Conference on Explosives and Blasting Technique, New Orleans, Louisiana, January, 27–31. Kanchibotla, S. S., Valery, W. and Morrell, S., 1999, Modelling ﬁnes in blast fragmentation andits impact on crushing andgrinding. Proceedings of Explo’99—A Conference on Rock Breaking Kalgoorlie, Australia: The Australasian Institute of Mining andMetallurgy, 44-137. Konya, C. J. and Walter, E. J., 1991, Rock Blasting and Overbreak Control. National Highway Institute, Virginia. Kuhlmeyer, R. L. and Lysmer, J., 1973, Finite Element Method Accuracy for Wave Propagation Problems. Journal of Soil Mechanic and Foundations, 421-427. Liu, Q. and Tidman, P., 1995, Estimation of the dynamic pressure around a fully loaded blast hole. Retrieved from Canmet Mrl Experimental Mine: http://www.nrcan.gc.ca. Moore, A. J., Evans, R. and Richards, A. B., 1993, An elliptical airblast attenuation model. Proceedings of the 4th International Symposium on Rock Fragmentation by Blasting – Fragblast-4, Vienna, Austria, 247-252. Nicholls, H. R., 1964, A case study of the validity of scaling laws for explosion-generated motion. Washington, DC: U.S. Bureau of Mines (USBM). Roth, J., 1979, A Model for the Determination of Flyrock Range as a Function of Shot Condition. Los Altos: U.S. Bureau of Mines (USBM). Sharpe, J. A., 1942, The Propagation of Elastic Waves by Explosives Pressure. Geophysics, 7, 144-154. Starfield, A. M. and Pugliese, J. M., 1974, Compression waves generated in rock by cylindrical explosive charges: A comparison between a computer model and filed measurements. International Journal of Rock Mechanics and Mining Science and Geomechanics Abstracts, 5, 65-77. Szuladzinski, G., 1993, Response of rock medium to explosive borehole pressure. Proceedings of the 4th International Symposium on Rock Fragmentation by Blasting-Fragblast-4, Vienna, Austria, 17–23. Vovk, A. A., Mikhalyuk, A. V. and Belinskii, I. V., 1973, Development of Fracture Zones in Rocks During Camouflet Blasting. Mining Science, 9(4), 383-387. Yoon, J. and Jeon, S., 2010, Use of a Modified Particle-Based Method in Simulating Blast-Induced Rock Fracture". Proceedings of the 9th International Symposium on Rock Fragmentation by Blasting-Fragblast-9, London: Taylor and Francis Group, 371-380.